The Pyramids of Cairo account for an incredible experience altogether. Kefre, the second pyramid adds to the same feeling. You could also enter the pyramid and explore the burial chamber of the tomb that is within the walls of Kefre. These iconic historic structures are to be witnessed in person. The television or clip will never be able to match up to a real experience. 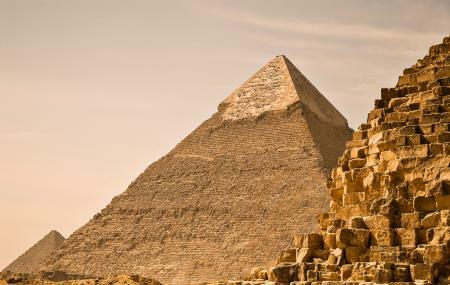 Therefore, do not miss the pyramids on a visit to Cairo. Also, visit the popular attractions in the city by following Cairo itinerary 4 days. Guided tours are available and recommended. Prices will depend on choice of tour. Timings will depend on tours. Use the tour vehicle or your own private transport. How popular is Kefre, The Second Pyramid? People normally club together Pyramids Of Giza and Sound And Light Show At Karnak while planning their visit to Kefre, The Second Pyramid. Absolutely staggering monument. The effect this place had on me when I looked up at these ancient colossal constructions was immense to say the least. I was lucky enough to enter one of them and view the internal structure. It was paradigm shifting. I was massively surprised that the proximity of the Pyramid site was so close to the City of Cairo but there we go, it makes sense when you are there in the flesh and not watching an Indiana Jones flick. Be careful when around the Pyramids as locals can harass you for money and place a serious rick on any valuables or children you may have with you. The Pyramid of Menkaure was built in Giza Necropolis next to the huge pyramids of his ancestors Khufu and Khafre. This pyramid is visibly the smallest among the three notable pyramids of this necropolis, with a height of only 65.5 meters. It was constructed over a large base of 108.5 meters made of limestone.